We noticed that the people across the street were having a garage sale. Those neighbors have a garage sale 2 or 3 times a year. It's crazy! They must know someone that refurbishes bikes. There is always a ton of bikes out there. I knew Isaak's bike was getting much too small for him. I yelled to Travis, "Hey can you take Isaak across the street to look at bikes. His is too small. He needs to go up a size." Travis was annoyed. He looked out the window and said, "I only see pink bikes." I said, "Whatever! It will take you 5 minutes tops." He ended up taking Isaak across the street to look. Travis knows much more about bikes than I do. I was in the process of making breakfast. Travis came back with a gold and white $20 bike. Isaak's favorite color is gold, so it was perfect. 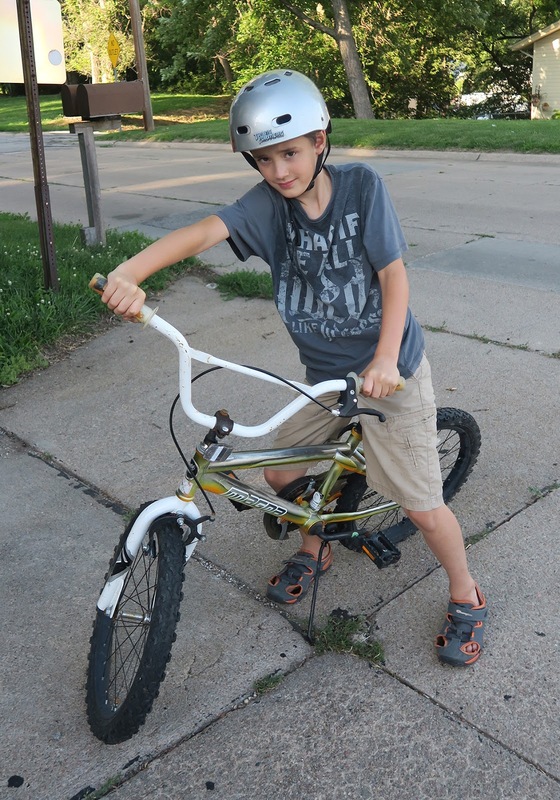 Travis went back over, and told them that they could sell Isaak's old bike. They gave Travis $10 back. It was a win, win situation especially since Isaak's old bike was refurbished as well. I do wish our kids could ride bikes better. We don't have sidewalks, so whenever they ride we have to make an effort to go to a park, or school. It's not like when I was younger, and we rode bikes around the neighborhood. When my parents were little they rode bikes around the whole town. We watch our kids to make sure nothing happens to them. It's just a different world we live in today. Isaak's still wobbly, and has to ride on a trail. Mica's refuses to try and ride standing up to get more power. Do you like riding bikes? Our kids have to ride bikes on our gravel driveway or in the horse arena. It isn't ideal, but at least they ride. Spiffy new bike at a great price! We don't have sidewalks either, but we live on a court, so not much traffic goes down our street, I let the girls ride up and down the road. woah what a good deal and it looks fancy with the gold paint too! we need to have a yard sale, broxton isn't playing with toys that much... but at the same time, i don't want to get rid of them in case savannah wants them. lol.